We made a quick two-night stop in London this past weekend between our stays in Wales and Scotland. We decided to try train travel between cities for the last few weeks in the UK, and our first train trip was between Cardiff and London. I was very grateful not to have to drive in London.We had one full day to tour the city, and I was pleasantly surprised by how many spots we were able to see. 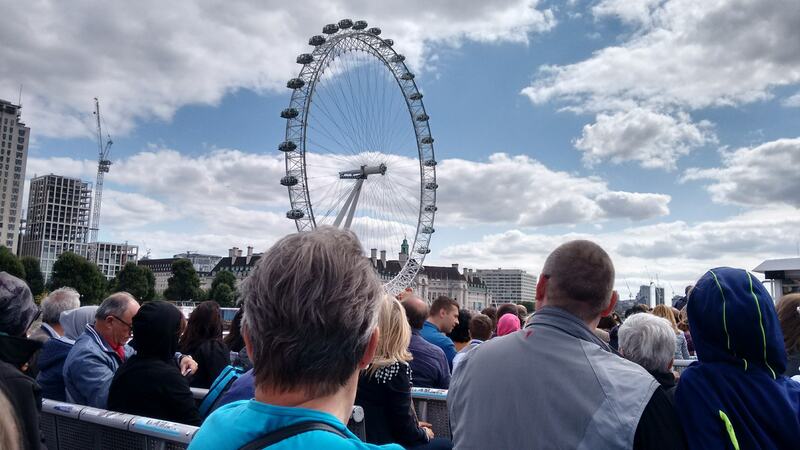 We did another “Hop on, Hop off” tour in London under (almost) blue skies and sun. Our tour took us by Big Ben a few times. Our timing was actually rather serendipitous here. We toured the city on Sunday, and Big Ben went silent on Monday for four years of repairs. Very near to the clock tower that houses Big Ben is Westminster Abbey. 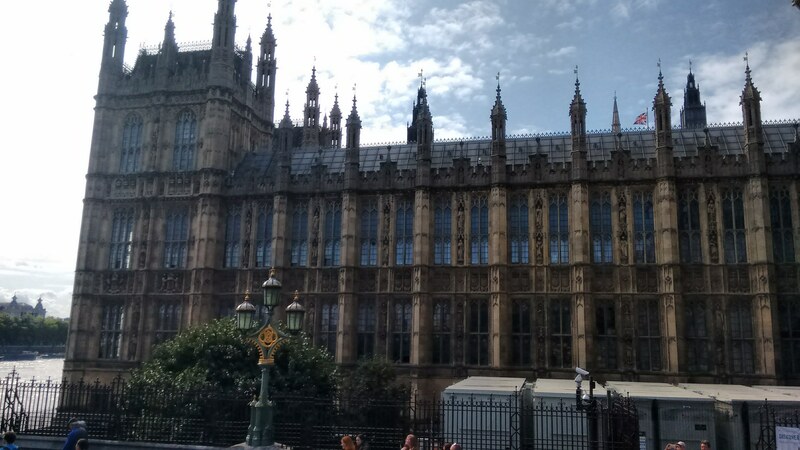 More than anything, I think I was surprised by how close together things were in Westminster. My new favourite sound, is the sound of the bells at St. Paul’s Cathedral. It put a big smile on my face to listen to those bells. This is a photo of the Tower Bridge. I had always thought that this was the “London Bridge”, but it is not. London Bridge is actually really bland and boring looking (so much so – that I didn’t think it was worth taking a photo of). The Tower Bridge is built to blend in with the nearby Tower of London. We “Hopped off” our tour at the Tower of London to do a tour of this attraction. Not all of the displays were open, but we did get a chance to see the Crown Jewels, tour the exhibit related to the history of the Tower as a Mint and eat some ice cream. 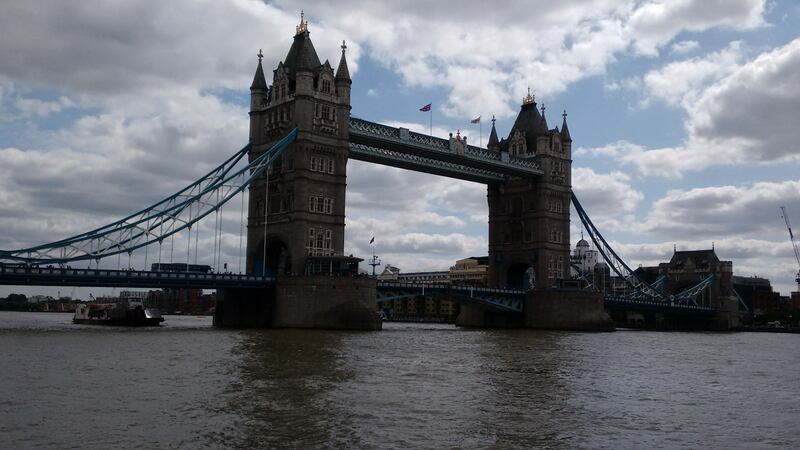 We took a boat tour on the Thames river during our day in London as well. I love the perspective of a city that we get when we see it from a boat on a river. This is a photo of the London Eye. We drove by Harrods, but we did not get a chance to shop there. By this point in the day – we were all tired and had enough of doing “touristy stuff”. While we’ve had a lot of incredible accommodations throughout our trip, I can’t say that any of us enjoyed our hotel in London. We were incredibly close to King’s Cross Station and had showers with decent water pressure and hot water during our stay… but that was about where the positives ended. We were all woken up at 3 am by a street brawl just below our windows on our first night there. Listening to a dozen or so men yell and throw bottles at each other is not my idea of a good time. Our second night was a bit better, but we weren’t sad to leave London. London definitely lands on our list of “Places we are glad we visited, but have no desire to return to”.